Because bottom round rump roast comes from the well-exercised hindquarters of the cow, it contains a large amount of collagen and connective tissue that make the meat tough and chewy. A rump roast with the U.S. Department of Agriculture's grade of Choice means that the beef has less marbling from fat than beef graded Prime, which also contributes to its toughness. While you don't have a lot of options to choose from when cooking a rump roast to ensure that it is flavorful, juicy and tender, there are a few techniques that use slow cooking to produce a perfect roast. Roasting is a dry-heat cooking method usually reserved for cuts of meat that are naturally tender, but bottom round rump roasts are one of the few exceptions. 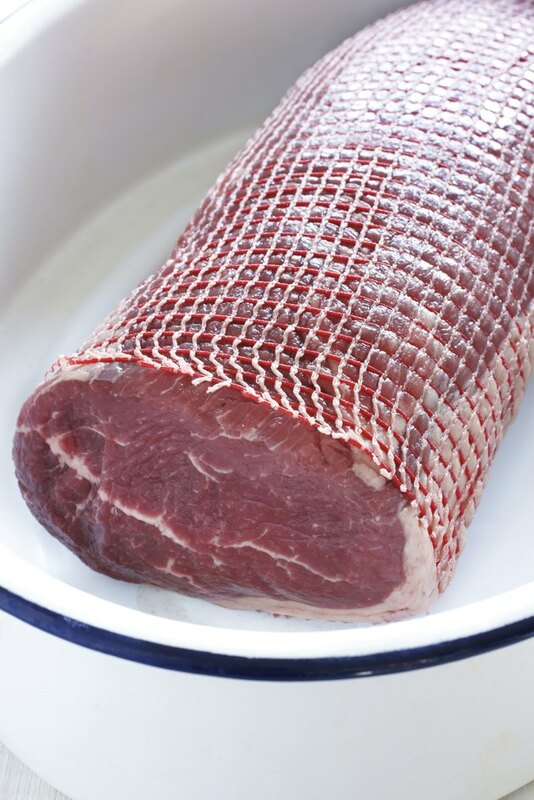 When dry roasted in low heat for a longer period of time, the collagen and connective tissue melt, leaving you with a tender roast beef. Since you are working with a Choice grade of beef, do not try to cook this as you would a regular roast, as the result will be a piece of meat that is dry and tough. Season the roast, sear it in hot oil and cook it in a 250 degree Fahrenheit oven for roughly 30 minutes per pound. One of the keys to keeping it tender is to slice it very thin just as you find in a delicatessen. In fact, if you purchase roast beef in a deli, there is a good chance you are getting rump roast. Whether your roast is graded Prime, Choice or Select has less importance when braising, as all grades will come out extremely tender. Braising is a method for making pot roast that involves cooking the beef in a covered slow-cooker or Dutch oven in plenty of liquid. Like the slow-roasting method, braising also involves using a low heat for an extended period. Dredge your roast in flour seasoned with salt and pepper and sear it on all sides. Add a small amount of liquid, roughly 1/2 to 1 cup, cover the pot tightly and simmer over low heat for 1-1/4 to 2-1/2 hours. If you need to free up your stovetop, place your pot or Dutch oven in a preheated 325 degrees Fahrenheit oven after adding the liquid. Bottom round rump roast makes good stew beef. Cut the roast into 1-inch chunks and then proceed as if braising a roast, starting with dredging the beef in flour and searing it before adding liquid. You will need to add much more liquid for stewing, as the liquid should completely cover the beef. When choosing your liquid, think about the final flavor of the stew. You can use wine, stock or broth, or a combination of the three. The flour coating on the beef should thicken the liquid while it cooks, but you can use a mixture of 1 tablespoon of flour mixed with 1/4 cup of water to thicken it more before serving. Winter vegetables, such as potatoes, turnip, parsnips, carrots and onions, make a perfect accompaniment to rump roast, whether roasted, braised or stewed. Cut the vegetables in chunks and lay them on the bottom of the roasting pan or Dutch oven before adding the meat and liquid.